New in the Baltics! Radiofrequency energy is now used to reduce sweating. Sweating is an unavoidable and integral function of human body which, unfortunately, may also cause inconvenience. However, excessive armpit sweating is no longer an unavoidable process. New innovative solutions constantly emerge in the aesthetic medicine, including effective methods aimed at reducing sweating. 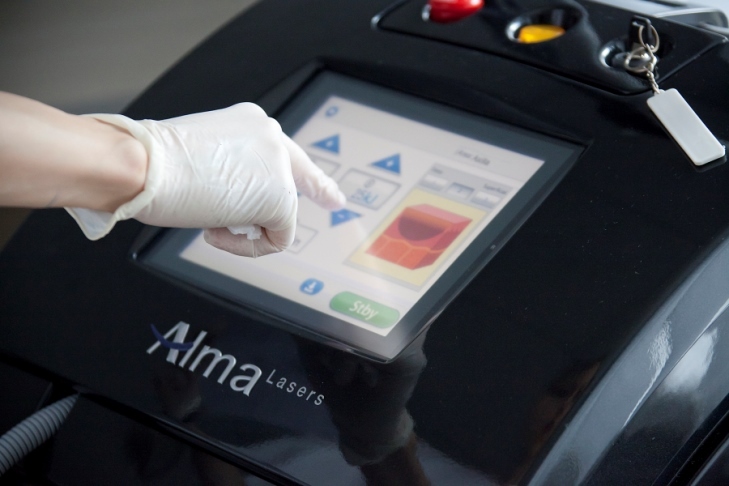 Now in Latvia - in beauty clinic 4th Dimension of Heath Centre 4 sweating can be reduced using Alma SweatX radiofrequency (RF) technology. Hyperactivity of sweat glands is immediately suppressed when exposed to elevated temperature during the procedure, ensuring long-term result. RF procedure lasts for 20-30 minutes. It is recommended to undergo 4 to 6 procedures with one-week interval depending on the amount and activity of sweat glands. The therapy course should be repeated once every 12 or 6 months. In order to make sure radiofrequency therapy selectively works from inside on both types of sweat glands located at different levels (up to 8 mm deep), the procedure is performed using two types of caps. When armpit areas are treated with circling movements, tissues are heated up to 45 ºC, and the temperature is maintained. Minor (iodine-starch) test is performed before RF therapy and during therapy to check the result in order to determine precisely the sweating spots and intensity of sweat gland activity. Armpits must be shaved, antiperspirants (aluminium chloride containing deodorants) blocking sweat gland activity must not be applied 24 h before the test. Application of such deodorants is also undesirable for a couple of days after RF procedure. RF therapy is contraindicated to pregnant and breastfeeding women; patients with chronic oncologic disease; patients with local active infections in the treated areas; patients who underwent Roaccutan therapy in the last year; patients with metal implants, cardiac stimulators and other electronic devices in the body.